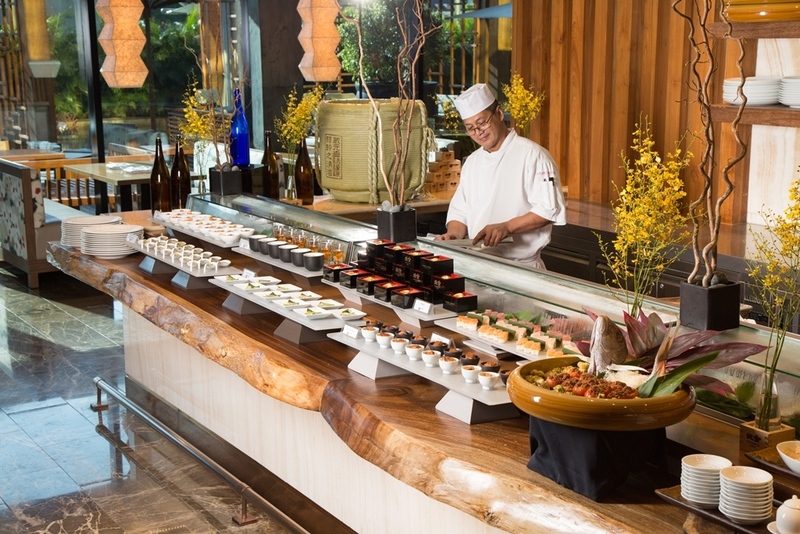 At Nobu Manila, the entire family can indulge in a lavish Sunday brunch buffet on Mother’s Day highlighting Japanese spice-rubbed steamship round of Wagyu beef, lobster Miso Sinigang, baked salmon, Nobu-style Kare-kare and seafood fried rice. 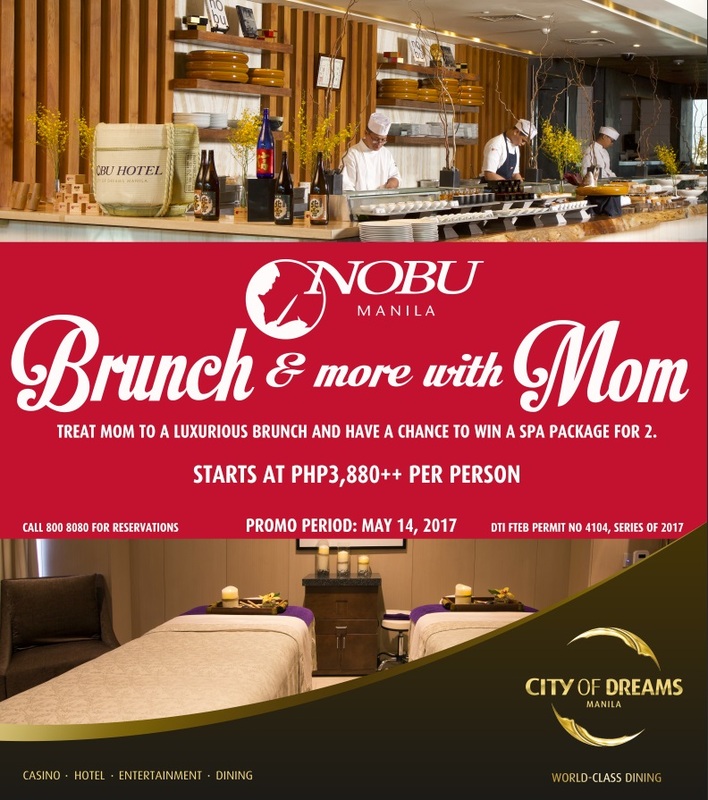 As an added treat, moms get a chance to win a Nobu spa for two in the Mother’s Day raffle draw. Nobu Mother’s Day brunch, inclusive of sodas, juices, mocktails, and iced tea is at P3,880++ per person. For an upgraded beverage package, P990++ and P1,990++ will be added for alcoholic drinks and premium champagne, respectively. Children ages six to 12 years old dine at half price while those five and below are free-of-charge. 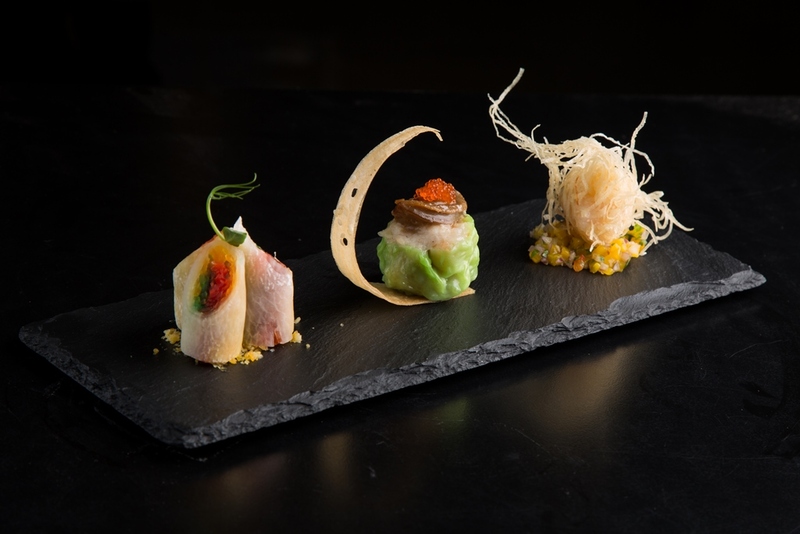 Mothers and their families craving for premium Cantonese cuisine will be spoiled with ambrosial delicacies in the two Mother’s Day special set menus offered for lunch and dinner at Crystal Dragon from May 1 until May 14. The six-course Munificent menu, offered for two to eight persons at P2,380++/person, consists of: the specialty appetizer platter of deep fried prawn balls with crab meat, chilled marinated spicy jelly fish, steamed abalone sio mai dumpling; braised seafood treasure with bird’s nest in superior broth; steamed cod fish fillet with cordyceps flower; sautéed fresh scallop with spicy XO sauce and celery; braised efu noodle with shredded pork and vegetables; and double boiled eight treasures with ginseng soup. The eight-course Virtuous menu at P4,380++/person, an expression of fondness for maternal virtues, is good for eight to ten persons and consists of: Cantonese “Four Seasons” combination platter of roasted duck rolls, deep-fried prawn balls, simmered shredded pork ear with spicy vinegar and marinated chilled smoked pork; home-style steamed tiger grouper with cordyceps flower; roasted U.S. duck in Cantonese style with plum sauce; wok-fried butter prawn with crispy pumpkin; braised abalone with mushroom, bean curd and broccoli; pan-fried egg noodles with seafood and baby cabbage; and a dessert platter of chilled mango puree, red bean snow skin and egg custard bun. 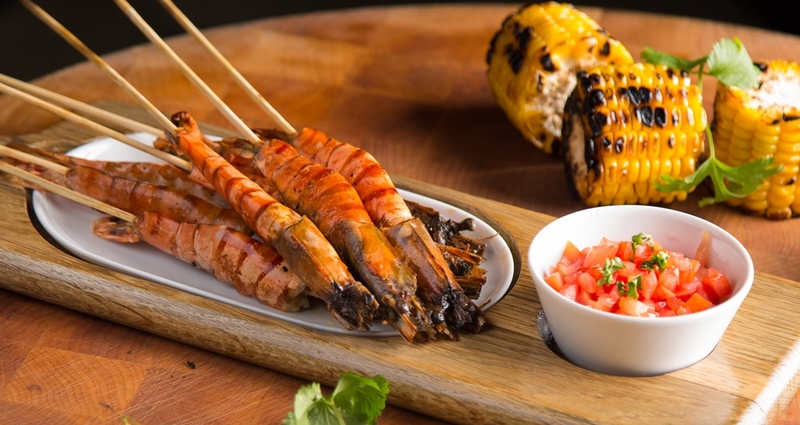 For an outdoor family affair on Mother’s Day, a barbecue buffet awaits at the beguiling resort ambiance of Wave poolside bar and restaurant from 5 p.m. to 9 p.m. Grilled prawns with lime, chicken Inasal, Lapu-lapu wrapped in banana leaves, black squid paella and aioli, oven-baked hickory-smoked Black Angus beef brisket and roasted chicken are on the buffet plus hot-off-the-grill Angus beef burgers, a selection of cheeses, dessert and crepes, and a Caesar salad station. The barbecue buffet is at P1,280.++ per person and includes one round of iced tea, soft drinks, fresh chilled juices or fruit shakes. Guests add P700++ per person for a selection of free-flowing non-alcoholic drinks, local beers and cocktails. At Red Ginger restaurant, moms dining on May 12 to 14 for lunch or dinner can avail of a whole Ube Violet Velvet cake at a special rate of P800++. 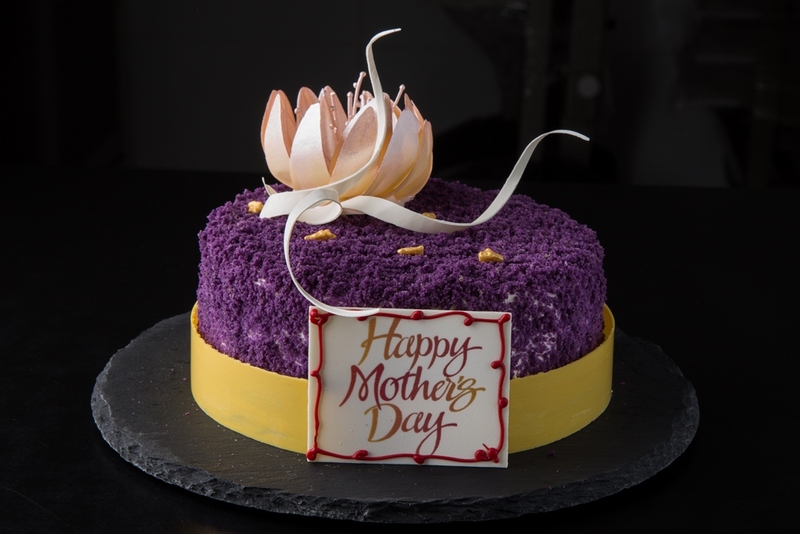 Also from May 12 to 14, the Café Society offers Mother’s Day flowers as gift for moms, from potted orchids to bouquets of roses. Families can opt for a fun-filled Mother’s day celebration at DreamPlay where one complimentary ticket is offered to moms if with at least two kids, and 50% discount on one ticket if with one child. DreamPlay also offers a Mother’s Day VIP Package at P1,500 per person, which includes a DreamPlay Pass, DreamPlay t-shirt, complimentary souvenir photo, VIP access to all the attractions, and activity passes to create-your-own heart shaped gingerbread with dedication for mom and Dreamworks-inspired Mother’s Day card to be displayed at a special wall. 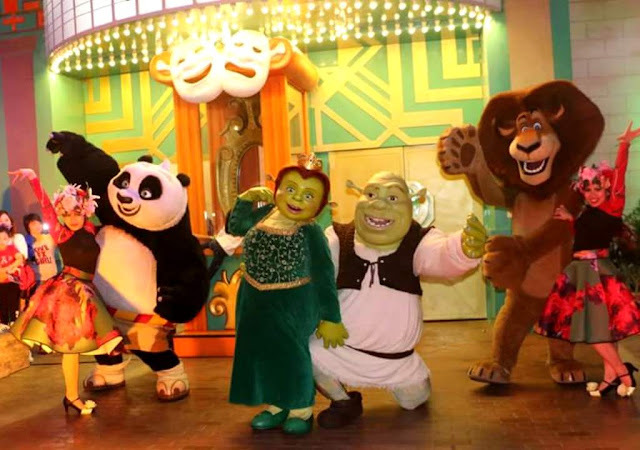 A special dance number of Fiona with the Dreamers also awaits guests. For inquiries and reservations, guests can call 8008080 or e-mail guestservices@cod-manila.com or visit www.cityofdreams.com.ph.